Mister Money Slot Information, Screenshots and which online casinos offer Mister Money Slot for Play. Warlocks Spell is an RTG Slot with an exciting bonus feature. A cool dude with lots of bling! Mister Money Slot is a 5 Reel, 20 Payline Progressive Video Slot with a Wild and Scatter Symbol, Multiplier and Free Spins. 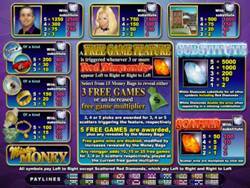 This game is part of the exciting Real Series line of video slots with excellent bonuses and features. 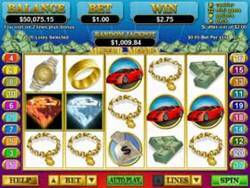 An attractive slot about the wealth we all dream of such as jewels, travel, cars and loads of money. Mister Money, Woman, Mansion, Private Jet, Fancy Cars, Watch, Ring, Necklace, Diamonds, Cash, and Money Bags. Betting amounts begin at 0.01 and go up to $100 per spin. The random progressive jackpot may be won at the end of each spin which to enhance winnings. White Diamonds will substitute for any other symbol to create winning combinations. But the exception is that the Wild also replaces the Scatter symbol, which is very unique. Any wins created by the Wild will be doubled. This Scatter is also unusual because it won’t pay anywhere on the reels, only from left to right and right to left, and the Scatter can be replaced by the wild symbol. Get 3 or more Red Diamond symbols to activate the Bonus Round and receive 5 free spins. During this bonus round 15 Money Bags will be presented, select a bag to reveal the prize inside. Additional free spins can be re-triggered when hitting 3, 4, or 5 Red Diamonds simultaneously during the free spins round awarding 10, 15, or 25 more free spins. Land all 5 Mister Money symbols on an active payline to win 1 250 coins for a 1 coin per line spin. The coin values may be adjusted according to how much you want to bet. Mister Money shows how life could be if the biggest Jackpot should be won! The game is easy to play, with sharp graphics, fun symbols and dreams for the future. Get a taste of the millionaire lifestyle, and grab some of the good fortune for yourself.